I realise now spring and autumn are my favourite times in the garden. It’s not too hot to be in the garden and there is not the constant worry of how the plants are faring under hot sun and low rainfall. And I’ve realised this year that trees and shrubs and other perennials grow more in spring and autumn. 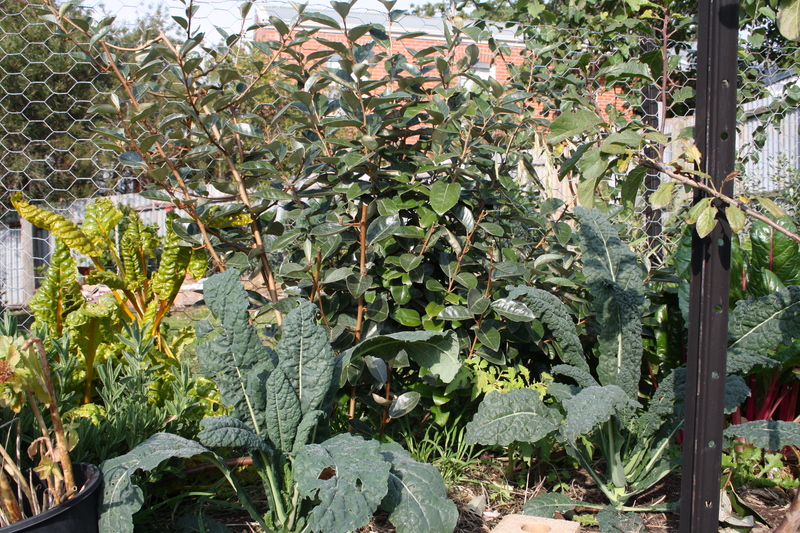 And it’s so easy to grow certain vegies in late summer/early autumn. New season garlic coming up. 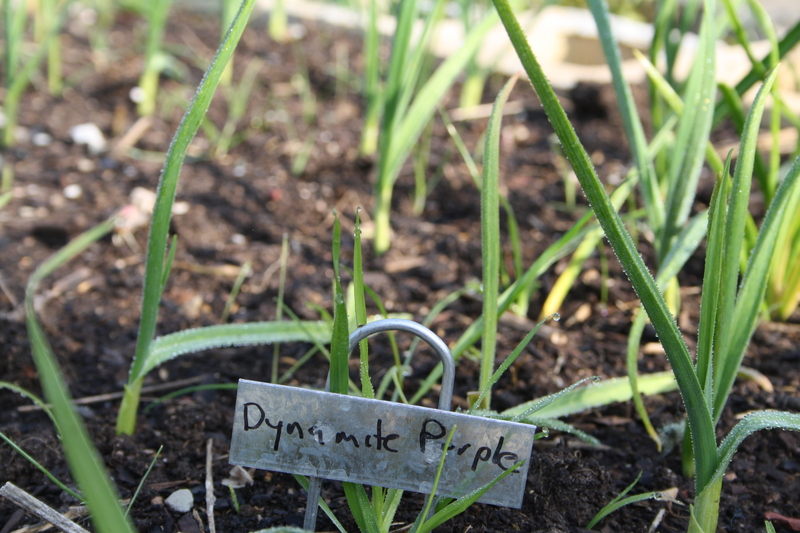 Dynamite Purple purports to store for 12 months. 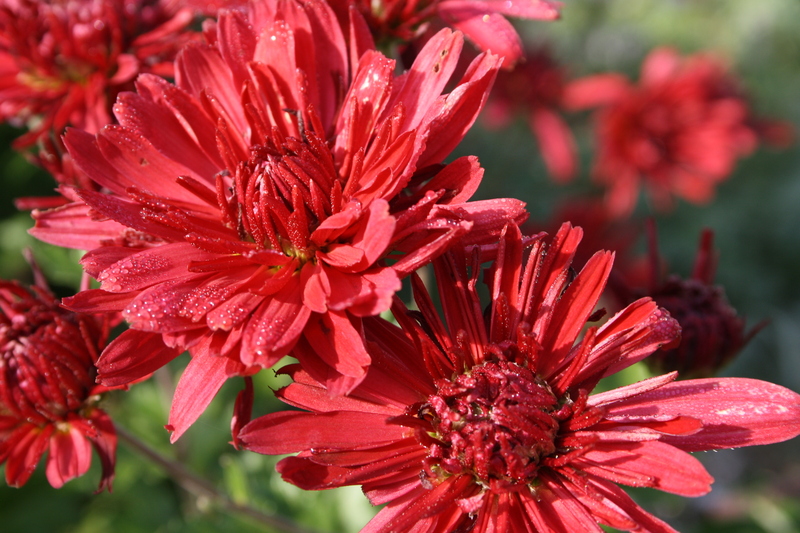 There are a few red things making me happy in the garden at the moment. 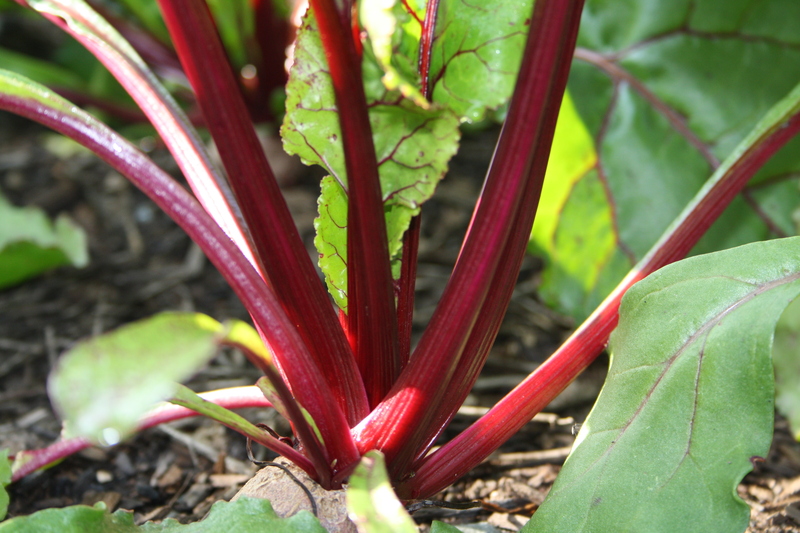 A beetroot crop grown from nursery seedlings is ready to go. I need some ideas for what to do with them. I love it, but my partner finds it too earthy I think, so I need something that sharpens it up. Ideas anyone? 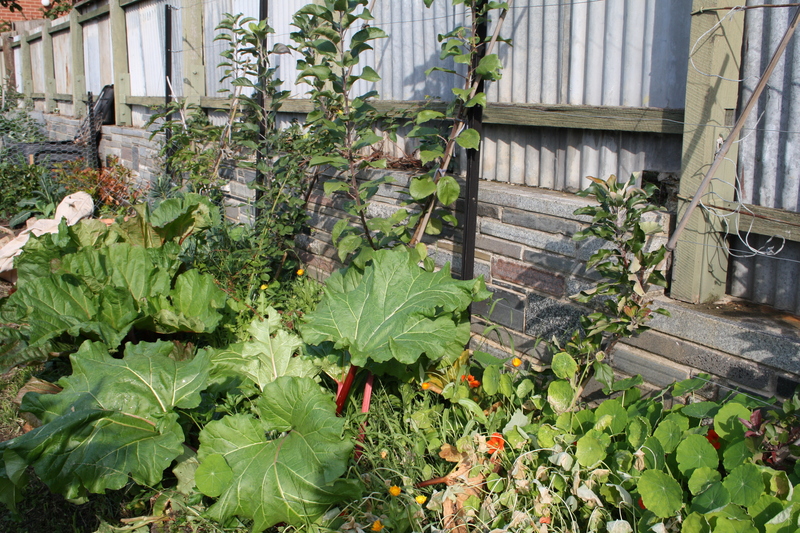 My two new rhubarb plants underneath my apple cordons. I’m a little obsessed by getting more and more varieties in the garden. All my rhubarbs is protected from the hot summer sun from the west by a tall fence and they also are on drip irrigation. Rhubarb really perks up in autumn. This is my potted manzanillo. 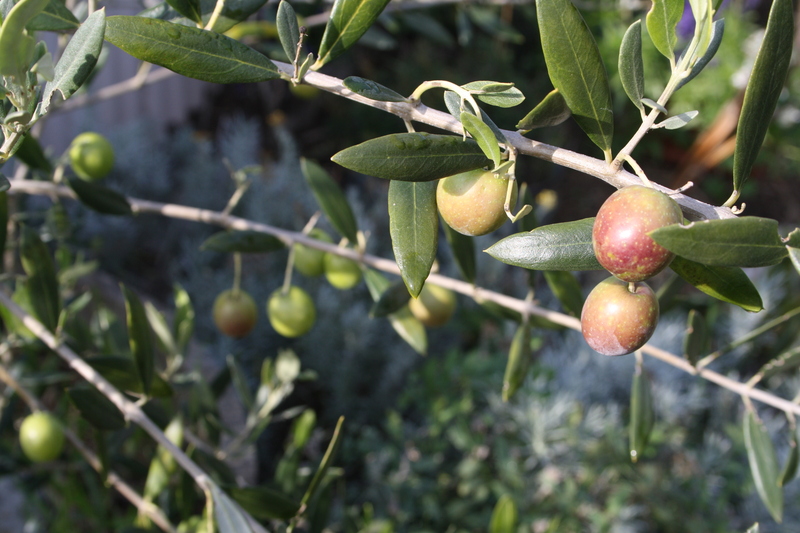 Let’s not talk about my other two olives, planted in unsuitable spots (not enough sun) and not looked after at all. 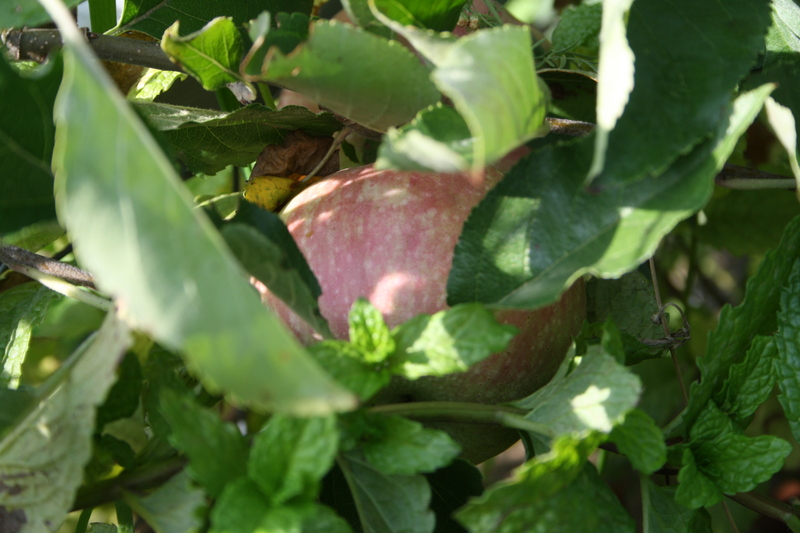 But this one has a small crop which I’m hoping to brine soon. I haven’t read the first thing about when to pick olives, aside from knowing it’s autumn. My baby Japanese mandarin (Okitsu Wase) has two fruit growing even though the plant has barely grown at all. To be fair, it was really, really tiny when I planted it. And yes, I should probably have removed the fruit to encourage it to grow upwards instead. But who can resist! Also, I dont want to think it has anything to do with the wormwood growing around it, which is supposed to have allopathic qualities. Another observation: it hasnt once shown any concern about frost. How I love things that give the finger to the frosts. Ok, I dont really have an orchard but I’m considering adding a mini orchard up the back half of the backyard where the chooks roam. Below are my two quinces which I planted last winter and grew so well and seemed completely impervious to both the hot, dry summer and the not particularly well prepared clay soil. Quinces get the drought-tolerant, unfussy home fruit tree tick from me. I have planted Angers (used as rootstock for other varieties apparently) and Powell’s Prize. Another interesting development is with my two feijoas up the the back of the backyard. They really struggled last summer. They barely grew and what did grow, got badly nibbled (I think by a native caterpillar an/or grasshoppers). It was really frustrating. 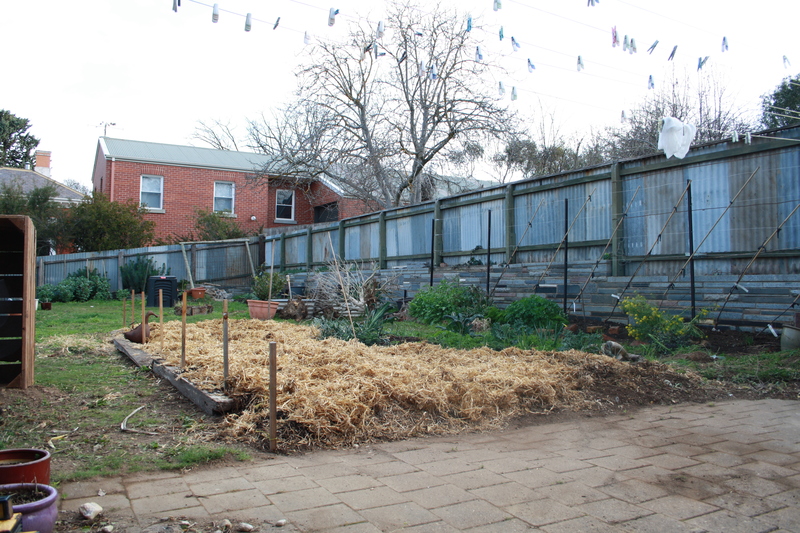 However, since the introduction of chooks into the area (which also has bad points to, see below, but in this case I think has cleared up the bugs), drip irrigation and spreading of the chook yard straw (ie. full of urine and poo = nitrogen) they have grown really well. Below is my Apollo. The Duffy next to it took a real knock but Im hoping next spring it will go from strength to strength. 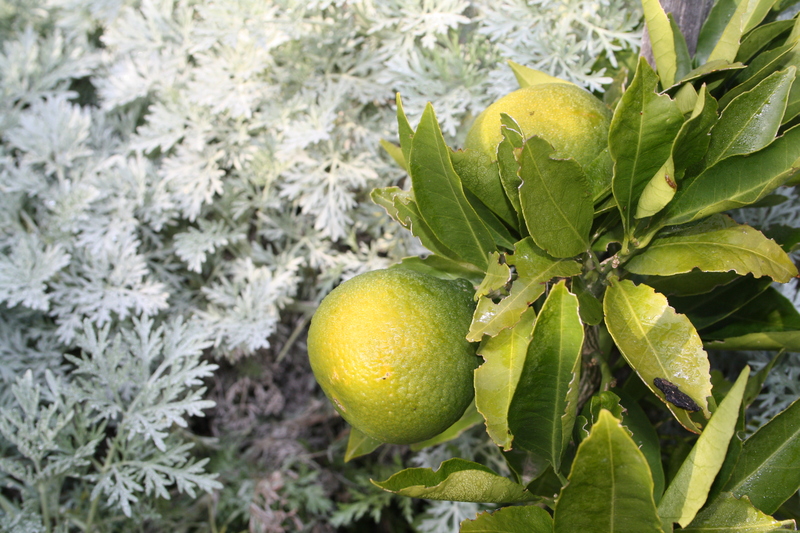 Here’s my Tahitian lime, being smothered by Chrysanthemums, naturalised bulb fennel, and wormwood. I’m observing whether being a bit squashed in over winter helps prevent frost damage. Last year I covered this baby and the mandarin next to it with shade cloth. Neither of them got burnt in our recent frosts. Fingers crossed. I always feel a bit overwhelmed at the end of seasons as everything goes to seed and looks a bit ugly and is taking up space that should rightfully contain the next season’s crops. But letting things go to seeds is so wonderful, because things start to naturalise and you don’t need to worry about managing them so much. I have self-seeding silverbeet now, calendula, tomatoes, parsley, fennel and brassicas. Brassicas don’t, Im told, grow true to type, but it doesnt matter with things like rocket and mizuna which you just grow for leaves anyway. 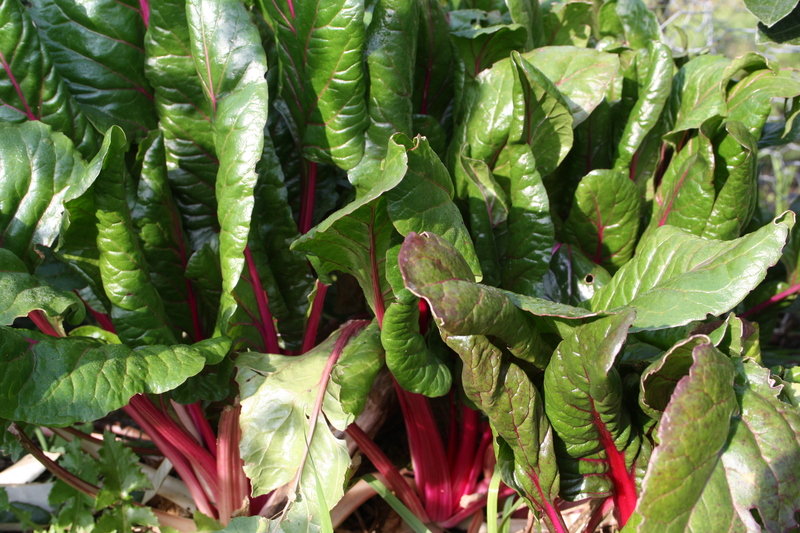 This silverbeet is right next to our chook area and I can throw them the young fresh leaves when I wander by. The most recent addition was the garden bed across the middle which I added last year, to make the backyard a space more comfortable for a human body to be in, and to create a bit of mystery, a green wall, and a front room and a back room. 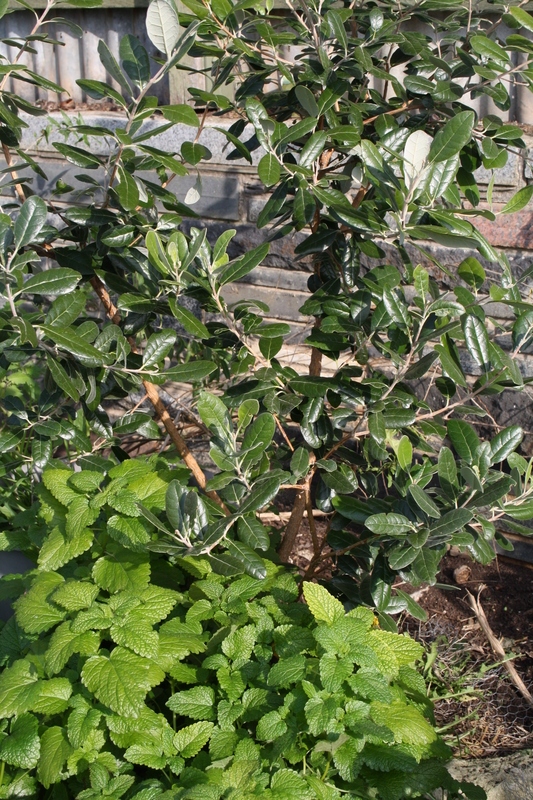 The new bed has two dwarf plums (Angelina and King Billy – neither of which have thrived in their first summer), and the start of a hedge of Eleagnus ebbingei (it’s drought tolerant once established and has a small fruit which Im told by a green thumb acquaintance tastes “almost quite good”). I really like Eleagnus so far. 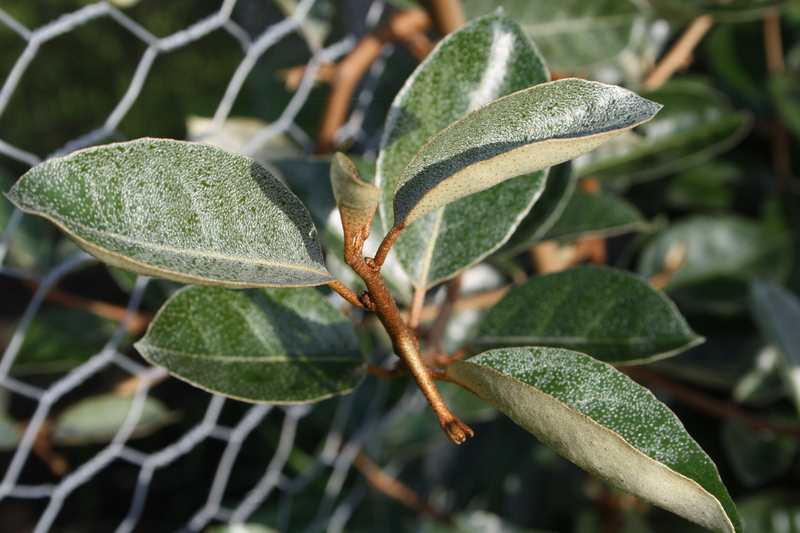 The new leaves shimmer – they’re pale underneath and silvery on top. I’m planting it up with other things, including greens, Chilean guava, rosemary and lavender. And mint. And a Strawberry guava, which Im quite impressed with so far. It grew a lot from a fairly spindly little thing, and hasnt been burnt yet by the frosts we’ve had. But it’s sort of growing side-ways rather than upwards. How do I encourage it to go vertical? Just wait and see what happens next spring? I know people say not to let mint grow outside of tubs. But I disagree now. It is so much easier to keep alive in a garden bed and it’s easy to control. Compared to couch grass anyway, which is the devil. 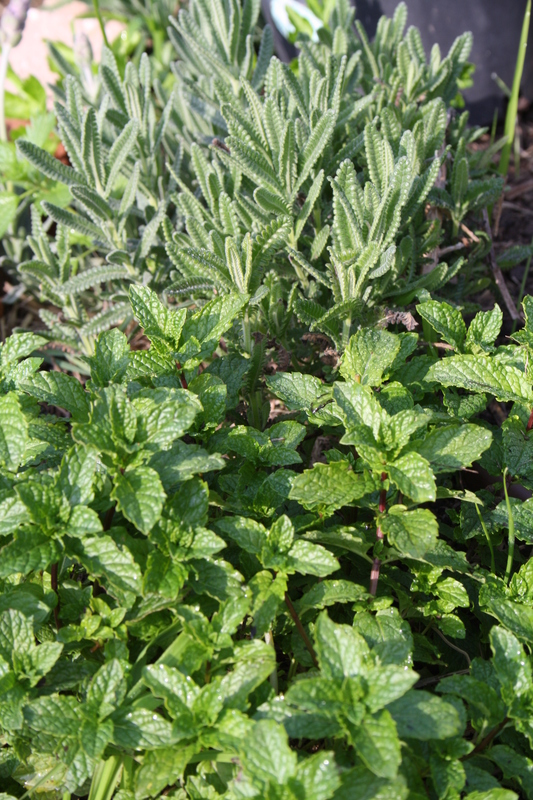 Below is Moroccan mint I got from the Diggers Club. It’s got a beautiful scent and flavour. Perfect for tea. 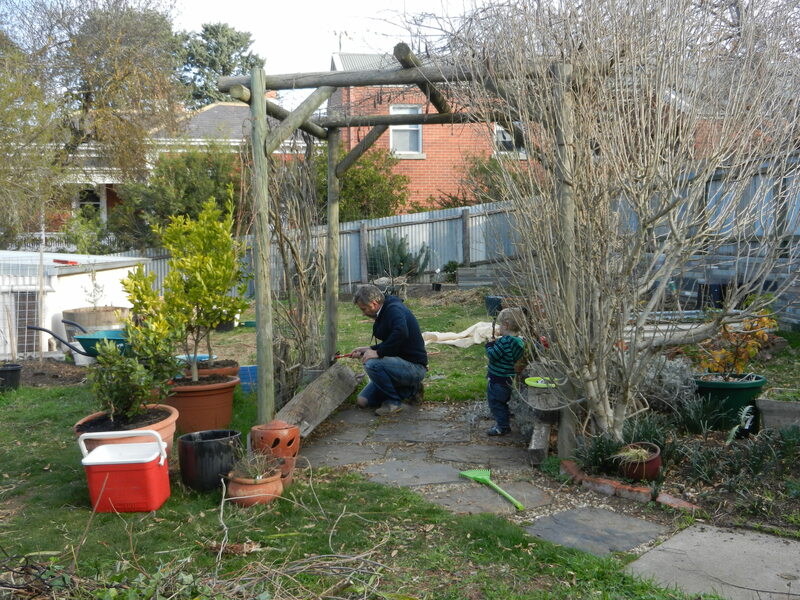 adding garden edging – never again will I build a new bed without adding edging! Weed control (couch grass. unstoppable really but this helps a bit) and bed maintenance (as in, stop beds from eroding away, from rain, bird activity, wind etc). It also makes the garden look well kept. And the red brick gives a warm feel. All my red brick has been scavenged from people. 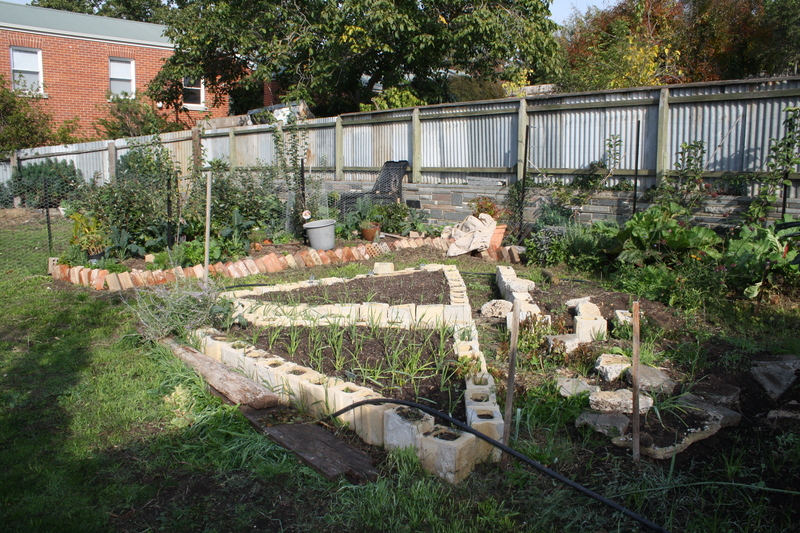 dividing up my enormous rectangular vegie patch so there are dropped paths through it. I’m doing a square divided into triangles. I used these landscaping bricks I bought second hand for cheap. They are hollow and Im going to try and plant herbs in these hollows. Not sure sure how that will go exactly. Stay tuned. 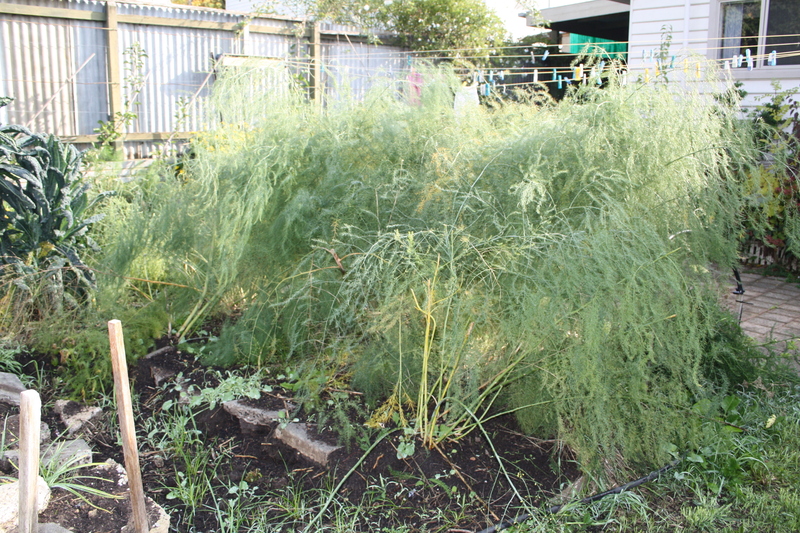 At the bottom of the square is my asparagus bed, which I wasn’t about to move because it’s one of my great garden joys and I didnt want to set the crowns back and risk next spring’s crop. It’s about ready to cut down to ground level for winter. 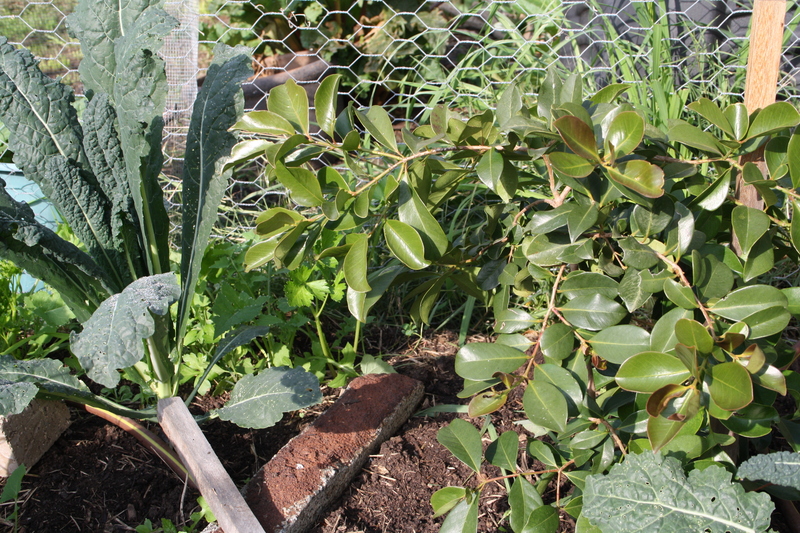 Ive also been trying to plant up my peripheral beds with shrubs to give the garden more body. 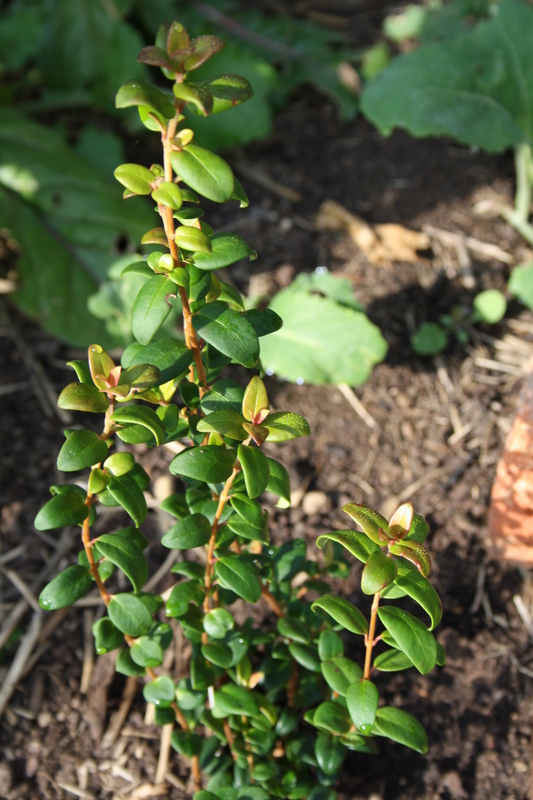 Ive been planting rosemary, lavender and also a handful of these Chilean Guavas throughout the garden. I’ve seen them growing the Garden of St Erth as a box replacement, and they grow a tiny red berry that Im told tastes like sherbet. We shall see. We lost two chooks over the past year. 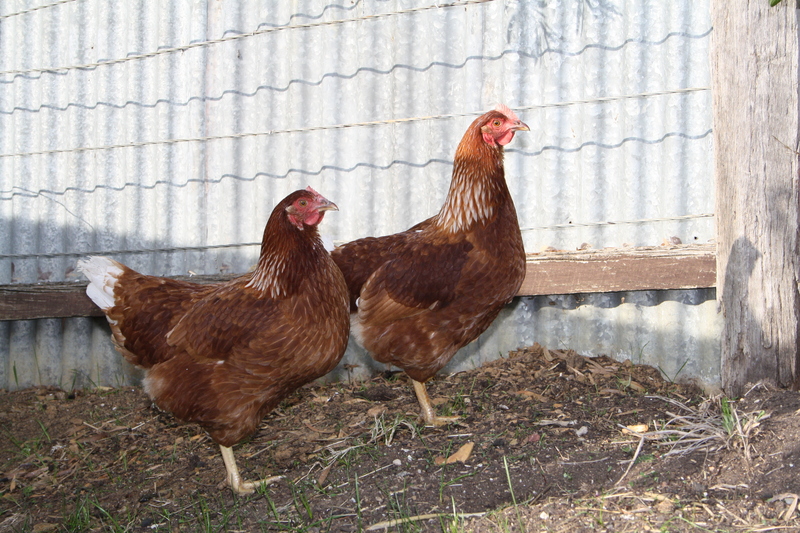 So last Sunday at the farmers’ market we bought these two women home: Anastasia and Isabelle 2nd. They’re young and not laying yet. The breeder told us to sneak them into the roosting house at night to minimise bullying by the older ones. They seem to be tolerating each other so far (we have two others: Peggy the Rhode Island Red, and Megan, the Isa Brown). The new ones are Lohman Browns and I am quite enchanted with them. They have a lovely splash of cream across the back of their necks. The chooks have wreaked havoc in the back yard wherever I have not protected the soil and plants. 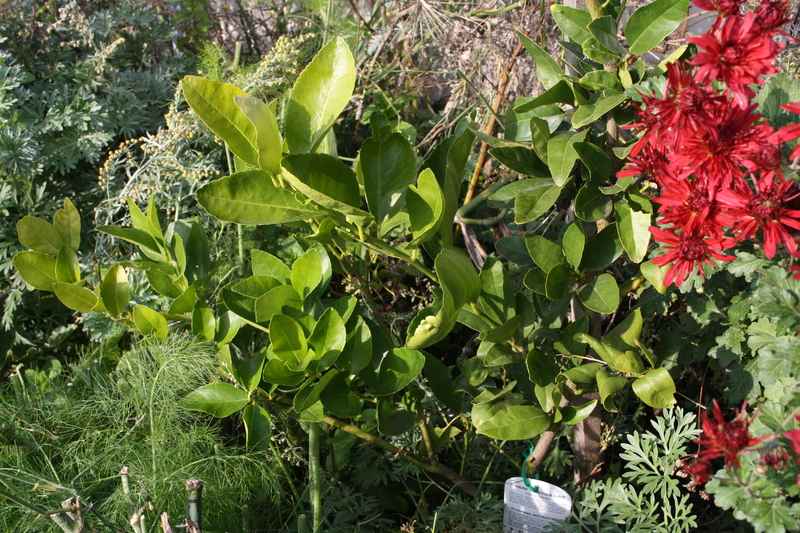 On the other hand there are obviously fewer bugs up the back, whereas every bug in the world is enjoying the front part of the garden (see above about my feijoas). 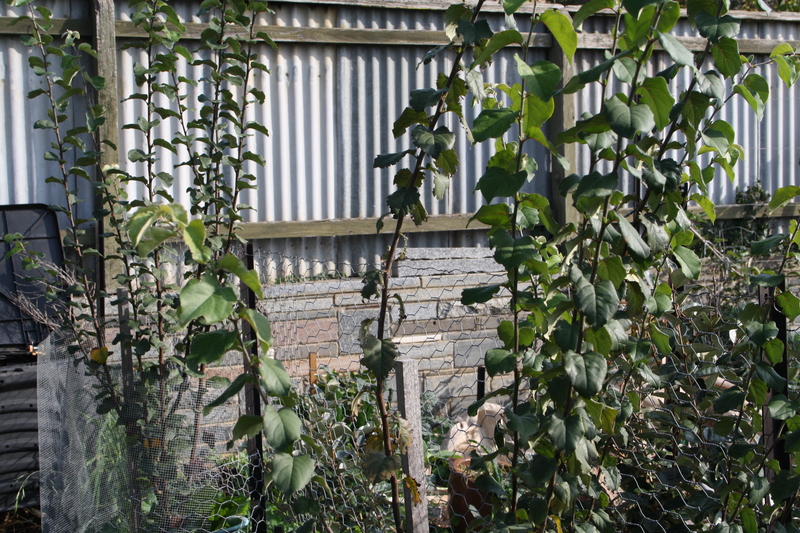 So the backyard is full of chicken wire and bricks and pots placed to prevent the chooks from accessing it. Im thinking about how to manage this – either reduce their access by a lot, or fence off all my beds. I dont love either of those ideas! ← Broad Bean Season 2016…. An enjoyable read! My garden is just a few pots in my balcony, tomatoes tamarind lemon etc, so reading your post was a treat. Thanks you! I am a very intermittent blogger…. Your balcony garden sounds great. Amazing how plants want to grow almost anywhere, with a bit of help. There is a great book by an Australian author Indira Naidoo about balcony gardening which I recommend.